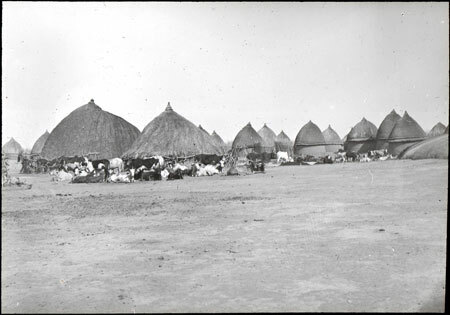 A view of a section of Fashoda village, in the morning, with cattle at their tethering posts near to the byres, with smaller sleeping huts visible to the right. Manual catalogue entry (thermofax catalogue copy in folder '27-06 Seligman Slide Collection') - "V.g.33. Fashoda morning scene"
Note on lantern slide ms ink - "V.g.33. Fashoda morning scene. CGS." Morton, Chris. "View of Fashoda, Shilluk village" Southern Sudan Project (in development). 03 Jan. 2006. Pitt Rivers Museum. <http://southernsudan.prm.ox.ac.uk/details/1967.26.237/>.